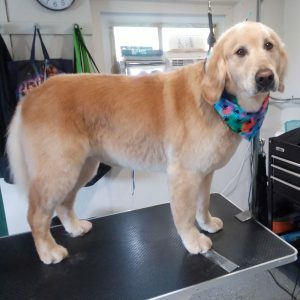 Ridgewood Canine Camp is proud to be able to offer full-service grooming to our clients. Our groomer, Heather, provides high quality grooming in a familiar, comfortable environment. We are a one-stop shop! Campers can be pampered and groomed during their regularly scheduled daycare visit or on the last day of the boarding stay. Either way, you pick up a fresh, clean, and happy pup! Please plan ahead when booking appointments. 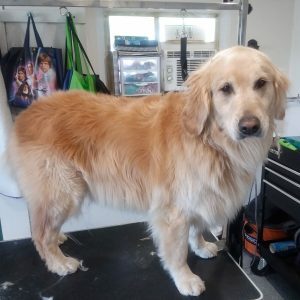 A full groom includes brush out, bath, blow dry, trimming or hair cut, nails clipped, and ears cleaned. Al cart services are available as well, including de-shedding and teeth brushing. Prices will vary by breed, condition of coat, and behavior of dog. Please call us at 610-401-0660 for a quote. Please note, grooming services are only available to current daycare or boarding clients.